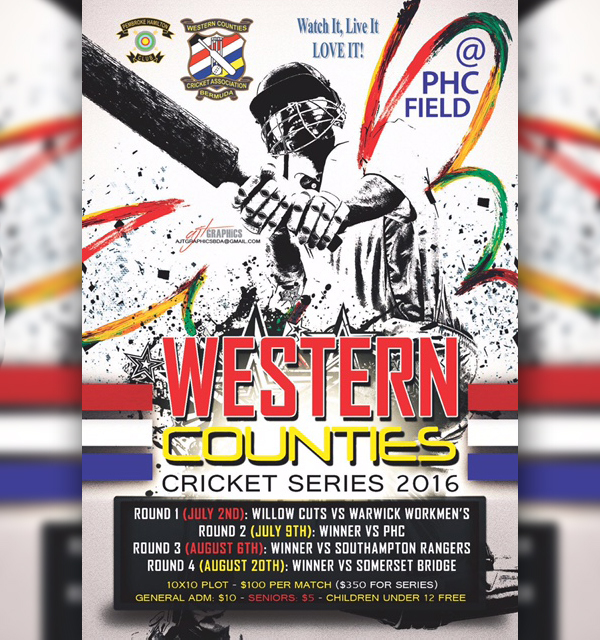 Pembroke Hamilton Club [PHC] in conjunction with the Western Counties Cricket Association [WCCA] announced that the 2016 Cricket Series will be held at PHC Field. “The WCCA has a history of over 50 years and this will be the first time that PHC has hosted the competition,” President of PHC Jonathan Ball said. “The first competition was contested in 1963 and the Willow Cuts Cricket Club was the first champion winning the Warren Simmons Cup which was to be played for on an annual basis. Kimberley Jackson, Western Counties Executive stated, “We are looking forward to PHC hosting the 2016 series. The current committee believes strongly in sharing the venues among the member clubs and PHC is a great option to support the Western Counties in raising the profile of the series. 10 x 10 plot area – $100 per match or $350 for entire series.